Keep updated by visiting Announcements periodically. You will receive dates and times of events and breaking news. Hope to see you back soon! We, the family and friends of Brody Tatman, wanted to inform you of an upcoming pasta feed that we will be hosting. This pasta feed will help Brody in his fight against cancer. In January 2012, at only 2½ years old, Brody was diagnosed with Acute Lymphoblastic Leukemia. He is currently undergoing treatment with his dad (Jeff), mom (Erika), and brother (Rylee) by his side. Please join us in Brody’s fight against Leukemia. With your help, we know we can make this a successful event. We will be having pasta made by the famous Pasta King with a silent auction/raffle on Friday, May 18th at the Rohnert Park Community Center. We are hoping that you would be able to donate towards our event. We are trying to gather package deals as main prizes as well as any other types of donations. We would appreciate whatever you may be able to offer towards our event. We will be sure that your company name is included in our publicity for the event as well as acknowledged the evening of the event. For more information go to the On The Road tab on this website. Steven had a successful training camp and looks forward to the up and coming season. His first two races are in Spain February 5 and 6. Check out his racing schedule on the Home page sidebar. We will hold our first drawing for prizes for the Race for Kids Fan Club members on the 5th of February which is the first race of the month for Steven. The prize winner will be announced in this Announcements tab and notified by email. "With the time we have on this earth, we should use it to help make the world an even better place." Congratulations to our June drawing prize winner Johan Raemdonck, Germany and our July prize winner Matthew Tennyson, USA. If you’d like to see what they won go to the Race for Kids Fan Club tab and click Monthly Fan Club Prize Winners to see the great prizes! Steven’s next race is tomorrow, Wednesday, August 3, 2011. He and his Team NetApp will be competing in Paris-Correze, 2, France. Check out Steven’s Race Schedule on this web site to see what races he has through the end of August. Steven couldn’t race in the Amgen Tour of California, his home state race. Steven wanted to hold the Race for Kids Fan Club monthly drawing to celebrate the race and to acknowledge his fiance Jennifer Caudill who is a Podium Hostess for the Amgen Tour of California. He also wants to recognize his Team NetApp teammates and directors. This is a major race for the young squad! They are going to make their presence known. Well! We are happy to announce that a long time Race for Kids Fan Club member and cycling fan, Matty Johnson won the May Drawing! Congratulations to Matty. Go to the Race for Kids Fan Club tab and click Monthly Fan Club Prize Winners to see the great prizes Matty won! Steven filed for non-profit status for his Steven Cozza Race For Kids program. His Steven Cozza Race For Kids program become a 501C3 charitable nonprofit! So now you can donate to Steven’s Race for Kids program. Make out your donation payable to Steven Cozza Race For Kids. All donations go to help disadvantaged children globally. As you all know I am putting together a charity ride to raise money for the Institute for Myeloma and Bone Cancer Research as well as to help the Rotary Club of Santa Rosa raise money for the End Polio Now program. The www.girobello.com total fund-raising goal is to raise over $50,000. I also will be taking part in this ride and am setting a goal for myself to raise $500 dollars for the cause. I am very passionate about helping find a cure for Myeloma Cancer because a friend of mine Gene Berman is currently fighting the disease. They are so close to finding a cure for this type of cancer and your dollar could make the difference. I have set up this fund-raising web page because I know a lot of you support me and my efforts but cannot make the ride June 25th. Please feel free to check out the link below and pass it on to any of your friends or family that also would like to contribute to my fund-raising goals. All you have to do is click on the link below and donate the amount you feel is comfortable to you. Congratualtions to Jared Vollmer whose name was drawn as the prize winner for April in Steven’s Race for Kids monthly drawing. Enjoy the prize with your sons Ryan and Ben! My friend, Gene Berman, is currently living with and battling Multiple Myeloma, a somewhat rare form of blood Cancer. Gene was diagnosed with Multiple Myeloma on 4/13/2007, and is still battling it. Congratulations to Martin Bordson! His name was drawn for the month of March Monthly Prize Drawing. The drawing is always held close to the day of Steven’s first race of the month. Steven’s first race this month is Thursday March 4th, Driedaagse Van West-Vlaanderen, Belgium. Check out what Martin won by going to the Race for Kids tab then scrolling down to Fan Club Monthly Prize Winners. I must say Steven is giving away some pretty cool prizes! Check Steven’s website Race schedule for the race and www.cyclingnews.com should also have something. Steven’s family are all very proud and happy for him. His “Never Give Up” attitude and the passion he puts into everything he does in life gave him the opportunity to experience this great day of racing against some of the best in the world. Today’s race in Mallorca, Spain was Team NetApp and Steven’s first race of the 2011 season. Congratulations to Marilyn! She won some pretty cool prizes. To see what Marilyn won go to the Race for Kids tab on his website and then scroll down the page and click the title Monthly Prize Drawing winners. Register NOW for the Steven Cozza Giro Bello Classic! Say hello to Steven. He’ll be signing autographs and riding the course. Come out on June 25, 2011 and have fun! By registering you’ll be donating to two great causes, Lymphoma and Bone cancer research and the Rotary’s Polio Plus eradication program, eradicating polio globally. We began the Race for Kids Fan Club drawing today to celebrate the first day of the NetApp training camp in Mallorca, Spain. Only fan club members are eligible. Happy to announce our first prize winner of the 2011 Road Race season. Congratulations to Jason Herman of Washingtob D.C. If you’d like to see what Jason won go the the Race for Kids Fan Club menu and click Monthly Prize Winners. The next drawing will be held on the day of Steven’s first race of every month. 11th January 2011, 11 a.m. Team NetApp is pleased to invite you to their official presentation to introduce the 2011 season. The successful debut 2010 season concluded with the designation „Newcomer of the Year“ on the UCI Europe Tour, and we are continuing our journey to the highest cycling ranks with the recent upgrade to Professional Continental Team. Ralph Denk (Teammanager Team NetApp) and Andreas König (Senior Vice President and General Manager NetApp EMEA) will take you through the plans for the 2011 season and introduce the squad including its newest international signings. Steven Cozza, Elite Cyclist, Team NetApp http://www.teamnetapp.eu Race for Kids program has named Families of SMA http://www.fsma.org ,the Steven Cozza Race for Kids Children’s Charity Award Recipient for 2010. Monies raised through Handlebar Mustache Apparel www.hbstache.com giving Race for Kids $3. for every Cozza “Never Give up” T shirt sold and monies collected at the Team NetApp Convention in Las Vegas, USA totaling $800 will be given to Families of SMA Spinal Muscular Atrophy in honor of little Aaron Phelps and his parents Meri and Robert. Steven began his Race for Kids program in 2010. Race for Kids is a program Steven started to raise money for children’s charities globally. Through his effort he hopes to help children who are disadvantaged because of poverty, physical or mental disabilities, being discriminated against, victims of war or natural disasters or other life circumstances beyond their control. The Race for Kids Fan Club members from 9 countries have raised over $9,000 in 2010. The Race for Kids program has several fundraising strategies including the Race for Kids Fan Club, the Cozza “Never Give Up” T-shirt, Steven Cozza Race for Kids Cycling Coloring Book (available soon) and people can contribute by giving directly to the Race for Kids program. In 2011 Steven will be applying for 501C3 nonprofit status. Make a donation to @STEVENCOZZA ‘s Race for Kids before the end of the year and you will get a Promo code for 30% off a T @hbstache. They donated $800. to the Carousel Fund http://www.carouselfund.org , by bidding on a ride with Steven Cozza, Elite Cyclist for Garmin soon to be joining Team NetApp http://www.teamnetapp.eu/en/home.aspx Jared Vollmer, David Stensby, Jim Quinn, Cara Peck, Linda Reeves, Michael Gill, Peter Kozelka, Zach Gillen, and Michael Woolsey all contributed to the Carousel Fund, a charitable nonprofit that helps children with life threatening illness. See below some photos provided by Jared Vollmer, photographer. Update: Steven at this very moment is on a plane headed for Germany! It’s Team NetApp’s first mini training camp. Steven recently returned from Las Vegas where he and his teammate, Timon Seubert ( http://www.teamnetapp.eu/en/news/official-team-blog/2010/11/7/timon-seubert-im-nearly-blind.aspx ) represented Team NetApp at a NetApp convention. Many of the NetApp employees identifyed themselves as cycling fans and were very enthusiastic about sponsoring Team NetApp. Team NetApp should have a very large following at the 2011 Amgen Tour of California! NetApp employees contributed to Steven’s Race for Kids program. All donations collected will go to one of Steven’s Race for Kids selected children’s charities, which are listed on his website. Support the Team Swift Junior Cycling Development Program and join us for a beautiful 30 mile or 50 mile ride through Sonoma Wine Country with Steven Cozza, and members of the BMC team! Steven will also be available in the afternoon for autographs and photos. Special guests include Katheryn Curi Mattis of the Webcor Builders Women’s Team. It’s a fun day for the whole family! This year the course will be same as last year starting and finishing at West County Revolution in Sebastopol. Riders of all levels will go at their own pace along the two loop course so everyone can enjoy a pit stop. Riders will receive a free cycling gift bag, free catered lunch and a raffle with fabulous prizes. Congratulations to Joanne Scott of Canada, our Race for Kids Fan Club monthly prize winner for the month of October! Way to go Joanne! To see what Joanne won go to our Race for Kids menu and click the Race for Kids monthly prize winners tab. We Caught Steven Cozza’s Dad in France trying out a new bike! Go Cozza Sr! Thought he retired after the scooter accident? Can’t keep the Cozza’s off the bike! Steven is very excited about this new development with his career. He had a contract with Garmin for the 2011 season, but made a career decision to leave Garmin to help further his development as a cyclist. Steven has been hired by Team NetApp out of Germany. Steven thanks Garmin for the opportunity to race for them the last 4 years. He now sees his new opportunity racing with Team NetApp as a natural progression for his career development. What he has learned from his experience with Garmin he now brings to Team NetApp being given a more leadership role on his new team for 2011. See below for further details. If this email is not displayed correctly, please click here. On their way into the Pro Continental league, Team NetApp has extended contracts with further riders from the present squad. At the same time, three new riders have been signed up. The US-American Steven Cozza, the Swiss U23 champion Michael Baer and the German talent David Hesselbarth are set to boost Team NetApp in the new season.Ralph Denk, team manager of Team NetApp, on the new signings: “Steven Cozza was a preferred candidate. He is not just a great guy, but someone who will help us to realize new sporting achievements with his ProTour experience. The signings of Michael Baer and David Hesselbarth highlight the fact that we are keeping a close eye on young riders, with the aim of acquiring these for our team. The blend of such talented riders and experienced international professionals will define our team in the season ahead.”Prior to changing over to Team NetApp, Steven Cozza, 25 years (USA), raced for four years for the now ProTour team Garmin-Transitions. As a former U23 national time trial champion in the U.S., Cozza will be contributing his fast pace in time trials, in sprint preparations and attacks in classic races. In the team he has raced for to date, Cozza’s strength was utilized above all for supporting his captains. With Team NetApp, the American will now move even further into the foreground. The signing of this popular Californian figure is also a clear signal on the part of the team management and main sponsor NetApp of their desire to participate as Team Pro Continental in tours in the U.S. in 2011.Michael Baer, 22 years (SUI), is joining Team NetApp from Team Atlas Personal-BMC. The current U23 national champion in Switzerland won a stage in this year’s Tour of Thuringia. Last year, the all-rounder finished third in a stage of the Tour de l’Avenir and, in 2005, clinched victory for himself in the junior edition of Paris-Roubaix. Baer is leading the Swiss U23 selection in this year’s World Championship in Australia.David Hesselbarth, 22 years (GER), is changing over from Team Heizomat to Team NetApp. The former German junior champion has achieved a convincing performance this year with top-ten placements in the German championships, the Bochum Giro and the Tour Alsace. Like his future team-mates, Daniel Schorn and Michael Baer, Hesselbarth will also be lining up on October 1 for the start of the U23 World Championship in Australia.Following the announcement of the contract extensions with seven of its current riders, it was possible to get three other riders to sign up with Team NetApp. The Belgium Dimitri Claeys, the Italian Cesare Benedetti and the German Timon Seubert will also be riding for Team NetApp in 2011. Claeys (23 years) has drawn attention to himself this season with his committed and aggressive style of riding. This season, Benedetti (23 years) was among those riders who rode the most times in Team NetApp. Seubert (23 years) most recently finished the Tour of Slovakia with a second place in the overall standing. “With Dimitri, Cesare and Timon, we have managed to retain extremely valuable riders. It is fantastic that we can look ahead to starting next season with the majority of our current team members. This underscores our claim to be constantly developing further as team and growing healthily”, says Ralph Denk. Cozza love the fans, especially when they have fun during a race by drawing his photo during the US Pro Championships on top of Paris Mtn. in Greenville, South Carolina! Steven says Go South Carolina! Go fans! “Special thanks to Erik, Brett and Ashley of Handlebar Mustache Apparel for donating $3. from every Cozza T sold to Steven’s Race for Kids program. Congratulations to Eric Cho, our Race for Kids Fan Club monthly prize winner for the month of September! Way to go Eric! To see what Eric won go to our Race for Kids menu and click the Race for Kids monthly prize winners tab. According to www.Cyclingnews.com Guide to Rider Transfers 2010 – 2011 Christophe Le Mevel, will likely sign with Garmin for 2011 campaign. UCI regulations stipulate that cyclist signings cannot be announced until September 1. I apologize to our Race for Kids Fan Club members for being late in holding our monthly prize drawing. I should of held the drawing August 4, the first day of the Tour of Demark / Post Danmark Rundt. We held the drawing this morning during stage 3, California PST. Congratulations to Arnie Cohen, our Race for Kids Fan Club monthly prize winner for the month of August! Way to go Arnie! To see what Arnie won go to our Race for Kids menu and click the Race for Kids monthly prize winners tab. Congratulations to Will Stelter, our Race for Kids Fan Club monthly prize winner for the month of July! Way to go Will! To see what Will won go to our Race for Kids menu and click the Race for Kids monthly prize winners tab. On June 5, Joseph Machado, a 13 year old kid began biking 2,700 miles across North America (California to Washington DC) to raise money for children, teens and their families, who are in need because of medical or mental health problems, or other life circumstances beyond their control. Joseph has become an example for all, that we can make a positive impact in the lives of others, and that at any age we can make a difference. Well, Joseph successfully completed his journey accross America raising money for disadvantaged children. “good job” ! You can still donate to Joseph’s cause see below. Go to www.BikingForAmerica.com and make a donation. Then sign up for my Race for Kids Fan Club and receive an autographed photo of me racing my bike in the Pro Tour of professional cycling. Steven was happy to recently learn that he will be racing this coming month, in the Brixia Tour, Lombardy, Italy. Steven says during the racing season he’d rather be on the bike than off. Check out Steven’s Race Schedule on the side bar of this web site to see his second half racing schedule. The second half of Steven’s racing season has begun. Check out his Race Schedule. Steven is currently in Italy. He has a race tomorrow. He says its beautiful where he is at. Says he’s near a beautiful lake. Steven’s tempted to go fishing after the race. Chris Wegienka from Livonia, Michigan won the June Race for Kids Fan Club prize drawing! Go to the Race for Kids tab to see what Chris won. Congratulations Chris! “On June 5, Joseph Machado, a 13 year old kid began biking 2,700 miles across North America (California to Washington DC) to raise money for children, teens and their families, who are in need because of medical or mental health problems, or other life circumstances beyond their control. Joseph has become an example for all, that we can make a positive impact in the lives of others, and that at any age we can make a difference. When we hear the cries in the dark for help we must never turn our back and walk the other way; we must be brave to step forth and be counted. The Cozza Team will be handing out glossy cards of this poster to anyone spotted wearing a Steven “Cozza Stache” at any time during the Tour of California. 1. 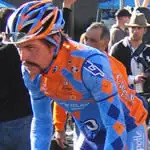 For any fans seen wearing the “Cozza Stache” by the Cozza Team anytime during the Tour of California they will receive a free beautiful glossy photo card of Steven racing his TT with the words “I’m so fast my shadow can’t keep up with me.” Every card will have a printed Cozza signature. So young and old, boys and girls, women and men can cut out the stache by downloading it off Steven’s web site or just make your own. The Cozza team will be looking for you at every event and stage of the race. 2. Steven’s Race for Kids Fan Club members will participate in a our monthly drawing which takes place the first race Steven is in each month. Steven has a great prize to give away for this drawing. So sign up now if you haven’t already and become a Race for Kids Fan Club member to become eligible for monthly prizes throughout the racing season. 3. Also look out for Steven Cozza’s Race for Kids Cycling Coloring Book. All proceeds from this unique and beautiful cycling coloring book goes to Steven’s Race for Kids children’s charitiy (s). You can receive a Steven Cozza’s Race for Kids Cycling Coloring Book free for a donation of $20. to his Race for Kids program. See you all at the Tour of California!!! Let have fun and cheer your favorite team. The Cozza Team will be cheering for the Garmin Transition boys! Go Garmin Transitions!!!! Now lets enjoy the race and have fun!!! We’re two women from Norway who are fund raising for Right To Play. We are both dedicated cycling fans, and have chosen Tour de France for the peak of the fund raising. There will be auctions with some great items donated by cyclists, teams and fan clubs, and a possibility to donate via justgiving.com. All the money raised will also go towards Steven Cozza’s ‘Race For Kids Fan Club’ total. We are both Steven Cozza Race for Kids Fan Club members. Help kids and join Steven’s Race for Kids Fan Club! Why did we choose Right To Play? Because their mission is to improve the lives of children in some of the most disadvantaged areas of the world by using the power of sport and play for development, health and peace. Check out our blog, where we among other things have ‘Rider of the week’ and articles about what Right To Play are doing. Today at Amstel my teammate Timmy Duggan broke his collarbone. Let’s keep Timmy in our thoughts for a speedy recovery. This is his second collarbone break this season. I know how disappointing this can be. The Race for Kids Fan Club held a special drawing for its fan club members to celebrate the historical Classic race, Paris Roubaux. This race is Steven’s favorite race. He wanted to hold this special drawing to celebrate the Classic race, Paris Roubaix. Congratulations to Tara Creevey of Australia, who is the winner of the Race for Kids Fan Club Special Paris Roubaix drawing! Tara won a Cozza autographed: 2009 Paris Roubaix Poster, Garmin Transitions CamelBak water bottle and a Garmin Transitions cycling cap. Enjoy the race! Go Garmin/Transitions!!!! My Godson Brodie watching the Tour of Flanders! Steven says the next 10 people to become Race for Kids Fan Club members will not only receive an autographed photo of Steven, but will also receive a Garmin / Transitions water bottle made by CamelBak, which is also signed by Steven. So select a children’s charity make a donation and sign up by going to the Race for Kids Fan Club tab on Steven’s home page. This CamelBak Garmin / Transitions water bottle give away will last until the 10 person signs up or will end on March 22, the first day of the Volta Ciclista a Catalunya, Spain, UPT (Pro Tour) – Steven’s Comeback race! Go to Steven’s Race Schedule to see the most recent update of his Comeback Race Schedule. On Steven’s birthday, he celebrates by announcing this month’s Race for Kids Fan Club prize winner. Please go to the Race Schedule on the home page to find out Steven’s first race back to the peloton. Steven’s 25th birthday is Wednesday March 3, 2010. Happy Birthday Steven! Go Cozzzzza!!! Steven’s Race for Kids Fan Club will be holding the monthly drawing for fan club members soon. so keep a look out in the Race for Kids Fan Club tab for the announcement of the prize winner. The Cozza “Never Give Up” T shirt is now available. $3. dollars from each shirt goes to Steven’s Race for Kids Fan Club’s children’s charities. So purchase a nice looking T shirt and at the same time help out disadvantaged children throughout the world! Just go to the home page to find a list of stores and an online site to pick up a Tshirt. Steven is now back in Spain beginning his rehab program. He has a positive outlook and is looking forward to getting back on his bike to help his teammates. Steven sends a heartfelt thanks to his fans, friends, teammates, Garmin staff and family for all their support. He also wishes his teammate Kirk Carlson a speedy recovery from his injury. Steven’s surgery was a success! He is now in his hospital room in much pain ringing the nurses for pain medication. He says he’s glad the surgery is over and very thankful for his surgeon, who also repaired damage to tendons from previous collar bone injuries. Steven will stay in the hospital today and leave for Girona tomorrow with help from Toby Watson, Garmin Transistions staff. After surgery Toby was a great support for Steven. Steven’s girlfriend, Jen will arrive in Girona on Tuesday to care for him. Steven is now probably sound a sleep with a big simle on his cute face, dreaming of Jen being with him, fishing a wild trout stream somewhere in the mountains! Steven will have surgery tomorrow February 11th. Please keep him in your thoughts. His injury is more extensive them what was thought. He has one of the best surgeons in Europe specializing in collarbone injuries. Steven says he has a lot of confidence in his surgeon. He is hopeful the surgery will be a success and he’ll be back on the bike this season. Steven broke his collarbone today in stage 2 Tour of Qatar. He’ll be leaving tomorrow heading back to Girona for surgery and to rehab. Said he felt very strong today. He’s very disappointed; but is determined as ever to get back on his bike to help his team. It’s still early in the season. The Race For Kids Fan Club monthly drawing took place today and we are happy to announce Eric Schnakenberg was our February prize winner! Go to the Race For Kids Fan Club tab to see what Eric won! Steven wants to encourage more cycling fans to become Race For Kids Fan Club members. Way to go Eric!!!! Look for our March winner the day of Steven’s first race in March. We have our first prize winner for the monthly Race For Kids Fan Club drawing. The first drawing was held today January 17, 2010 to celebrate the opening of the Garmin Transitions training camp in Spain. Go to the Race For Kids Fan Club tab and click Steven’s Race For Kids Fan Club Monthly Prize Winner to see who our first winner is. A drawing is held each month the day of Steven’s first race. Only Race For Kids Fan Club members are eligible. Bibs are a must for serious cyclists. Drawstring shorts restrict your abdomen, making it harder to breath. Plus, bibs eliminate potential plumber’s crack. When it comes to backside health, a little chamois cream goes a long way. This is especially true if you’re jumping back into big miles. Lather up during rainy rides or races. Road grit from the asphalt can get everywhere, so best protect your assets. In the past, the Hulk Hogan look was faux pas. But lots of pro racers have been seen with their sleeves torn off, giving the sleeveless movement momentum. Just beware that crashing on bare shoulders can leave a nasty scar—and ruin your cool tattoo. Also, the rulebook says you must have sleeves to race. It’s okay not to wear gloves when training. It helps stop lame below-the-knuckle tan lines. But when racing, put on a pair to help protect your precious hands in the event of a fall, because even a small palm scrape can keep you off your bike for days. In cold weather it’s a no brainer. Layers keep you warm and give you options if the sun does come out. On hot days, a thin base layer helps wick moisture away from your skin—and provides one more layer between you and the road if there’s a pile-up. There are lots of fun options available from plain white to smiley faces. Here’s a simple guide: White socks for good weather; black socks for bad weather. High socks for skinny legs; low socks for stocky sprinters. Bumper-sticker slogans on your socks? No. Cycling Cap Under the Helmet? Why not? It’s a good mix of retro fashion and necessary function. But watch out on cold days. Wet cotton against the head is a bad idea. Use a synthetic cap instead. Keep your cap on while fueling up at the coffee shop—you’ve got a horizontal indent across your forehead underneath. Jackets help keep you warm and dry, but serious cyclists prefer vests because they usually do the trick with less bulk. That’s especially important when you’re continually taking it off and putting it back on during those long road rides. October 3, 2009 Steven became a Godfather for Brody Tatman! Yahoooo! Go Brody!!!!! The first drawing of the racing season for Steven’s Race For Kids Fan Club Members will be held the day of Steven’s first race of 2010. A drawing for prizes each month will be held at the time of Steven’s first race of each month. If Steven doesn’t race in a month then the drawing will always be held the first of the month. The last drawing will occur on the day of Steven’s last race in the 2010 season. Good luck to all of Steven’s Race For Kids Fan Club Members! *Prize Winners will be posted in the Race For Kids Fan Club menu under the title Steven’s Race For Kids Fan Club Monthly Prize Winners!